I am in a period of major bunny dreaming, even occasionally cruising over to Petfinder so that I can gaze adoringly at bunnies available at a local rescue (adopting one is a dream deferred since my place is already bursting at the seams with dog, cats and humans). Since I have bunnies on the brain, I was pleased to be given the opportunity to receive a copy of Smudge Bunny to review. 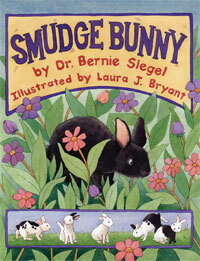 Inspired by his own rabbit, Smudge Bunny is a children’s tale by Dr. Bernie Siegal that depicts a little bunny taken from her happy, loving family by farmers and sent to a pet store to be sold. Immediately, some unsurprising situations arise: the bunny and her sister, Snowflake, are bought as Easter gifts, then squeezed into an inappropriately-sized cage and turned loose in the buyer’s back yard when Smudge accidentally claws a little girl as she desperately tries to prevent injury when a girl drops her. Smudge and Snowflake hop around lost for a bit but eventually both find themselves in the loving care of a capable and affectionate couple, Bernie and Bobbie. Smudge’s and Snowflake’s mother taught her kits that sometimes difficulties can lead to blessings. The book closes with Snowflake reiterating that Mama was right after all because she ended up reunited with her beloved sister and cared for by Bernie and Bobbie. Though the young rabbits do end up with a happy, loving home, the book does not tie up the portion of the plot surrounding Mama Bunny and the other babies very well. This in particular concerned my son, who asks without fail at the end of the book if the next part of the story will be that Smudge and Snowflake are going back to be with their mama. I enjoyed sharing this book with my kindergartner, and I recommend it for ages 5 and up. As mentioned above, for sensitive kids, the portion of the book in which the babies are taken from their mom may be hard to hear about.